It’s been almost two days since the Oscars were held and Leonardo DiCaprio achieved his life’s goal of sitting in Dolby Theatre with Joe Biden (oh, and winning Best Actor). Many viewers were riding high on a sense of vindication (journalism is fascinating! 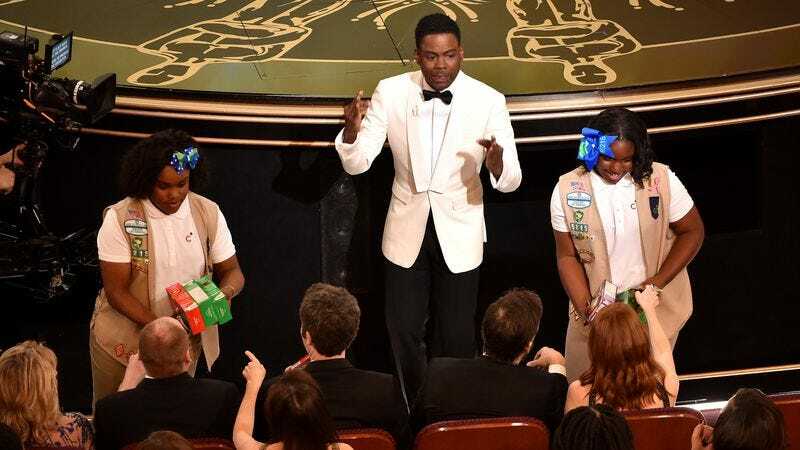 ), while others were heartened by the impromptu charitable display that saw host Chris Rock bring out his daughter’s Girl Scout troop to sell cookies to the famished attendees as part of a friendly contest with another parent’s troop. Although some celebrities shared their Samoas across the aisles, Rock declared on air that enough cookies had been sold to raise $65,243. Now that the cookie dust has settled, it seems Rock severely—and intentionally— overestimated the haul, as his daughter’s troop reportedly raised only $2,500 on Oscar night. (We at The A.V. Club were slightly skeptical of the original tally, as inspiring as it sounded.) TMZ broke the news of the four-figure total which, though not quite as much as $65,000, should still give Rock’s daughter’s troop an edge in the competition. And while that may just be the way the Trefoil crumbles, Entertainment Weekly reports that Girl Scout representatives are actually more grateful for the boosted visibility brought on by Rock’s goading of his fellow Hollywood denizens.